San Francisco is a favorite city to visit in California. It's a beautiful city with many dramatic hills, colorful architecture, and an eclectic vibe. The city is known for its liberal mindset and tech industry. 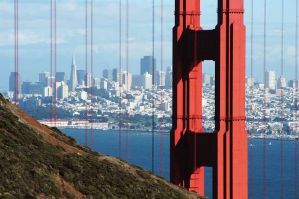 If you're a backpacker or budget traveler headed to San Francisco, there are a handful of affordable hostels in the area. Most hostels are safe and secure with a comfortable and relaxed atmosphere. Several hostels are more typical "party hostels", while others are more mellow. 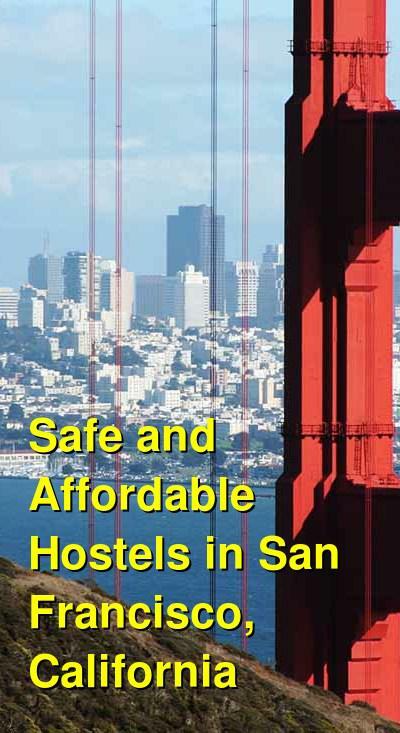 If you want affordability in a central location, the hostels below are good options in San Francisco. How much do hostels in San Francisco cost? A bit of a party hostel, but still quiet in the individual rooms. USA Hostels is a chain of hostels in the US. This hostel has a reputation for being a bit of a party hostel, but it's also a mellow place to relax and meet other backpackers. The staff are wonderful and they organize all kinds of events for guests. There are frequent bike rides to Golden Gate Bridge, pub crawls, and walking tours of the city. They also host group dinners and have karaoke nights. If you want a little peace and quiet, the dorm rooms offer privacy pods where you can enjoy a little space to yourself. There are only for beds per dorm room, so there's no overcrowding. Private rooms are also available for a bit more money. You can choose between twin and double private room with either private attached bathrooms or shared bathrooms. This hostel has some great amenities for guests as well. Security lockers are provided for guests staying in dorms. Private rooms have cable television, a refrigerator, and microwave. Breakfast is also included in the price of the room and includes pancakes, oatmeal, fruit juice, and pastries. The staff here can help you organize any activities that you might want to do in or around San Francisco. They offer discounts on tours to Yosemite, Muir Woods, and wine country. There's also a door to door shuttle service to USA Hostels Hollywood. A safe and affordable hostel in downtown San Francisco. HI San Francisco Downtown hostel is conveniently located in the heart of the city. The hostel is near everything you might want to see and do in San Francisco. The cable cars, Chinatown, and Union Square are all nearby. There is also great shopping and restaurants in the area. The hostel is located in an old 1909 hotel that still has a lot of charm and character. It's been fully renovated and now it offer a wide range of room types. There are gender specific dorms that sleep four people and co-ed dorms that sleep between four and eight people. There are also private rooms available with either a double bed or twin beds. If you're a group of three, there are private rooms with a double bed and a single bed. The hostel has a variety of a great amenities for guests. There's free wi-fi throughout, a complimentary breakfast every morning, and a full guest kitchen. The staff can also offer you all kinds of discounts on tours and activities in the area. This is a social place to stay where it's easy to meet other guests. There are regularly organized activities such as pub crawls, walking tours, and trips to Muir Woods, wine country, or Yosemite. A party hostel in the heart of San Francisco. Green Tortoise Hostel is a favorite party hostel in San Francisco. It's located in the historic North Beach area and is close to many popular neighborhoods including Chinatown, Little Italy, and Fisherman's Wharf. The hostel has a long history in the city and it has a reputation for being a fun and lively place to stay. It can get a bit noisy at night, particularly on weekends, but it is a safe and affordable option for backpackers in the city. This is a great option for backpackers who want to meet other travelers headed out on the town. The hostel offers all kinds of events for guests including group dinners and regular pub crawls. The hostel also has all of the standard amenities including lots of common space, a computer area, and security lockers in dorms. There's a full kitchen available that guests can use and breakfast is served every morning. The hostel has private twin and double rooms as well as a variety of dorm types. All of the rooms are non-smoking and they are large and secure.